"New York Times "bestselling author and award-winning educator Ron Clark applies his successful leadership principles to the business world in this effective and accessible guidebook, perfect for any manager looking to inspire and motivate his or her team. Includes a foreword by bestselling author and FranklinCovey executive Sean Covey. Teamwork is crucial to the success of any business, and as acclaimed author and speaker Ron Clark illustrates, the members of any team are the key to unlocking success. Imagine a company as a bus filled with people who either help or hinder a team's ability to move it forward: drivers (who steer the organization), runners (who consistently go above and beyond for the good of the organization), joggers (who do their jobs without pushing themselves), walkers (who are just getting pulled along), and riders (who hinder success and drag the team down). It's the team leader's job to recognize how members fall into these categories, encourage them to keep the "bus" moving by working together, and know when it's time to kick the riders off. In the tradition of "Who Moved My Cheese?" 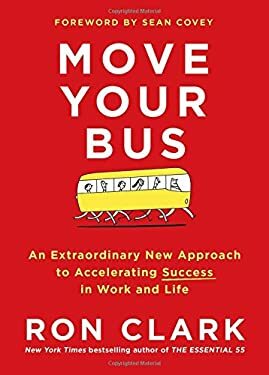 and "Fish ," "Move Your Bus" is an accessible and uplifting business parable that illustrates Clark's expert strategies to maximize the performance of each member of a team. These easy to implement techniques will inspire employees and team leaders alike to work harder and smarter and drive the organization to succeed. New (389 available) BRAND NEW. Over 1.5 million happy customers. 100% money-back guarantee. Make your purchase count: support Better World Books' worldwide literacy partners.